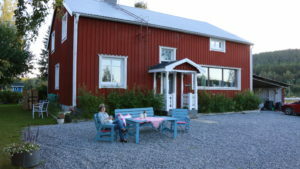 The apartment is located in the country side, 23 minutes/23 km from Umeå town. 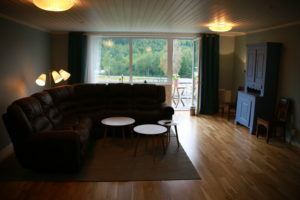 A large upstairs apartment – 95 square meters with separate entrance. 3 rooms and 2 bathrooms, kitchen and a balcony. Washer, dryer, fridge & freezer. Free Wi-Fi, TV, Apple-TV with Netflix and Chromecast. Sheets and other linens are included. There is also a set extra for each bed. Extra room with bed could be used. Plus one extra bed and two baby-beds. Totally 6 adults and 2 small kids could stay her with no problem. 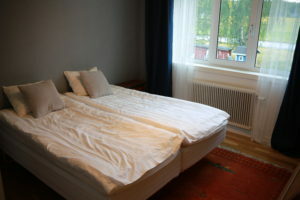 We are located in country side in the stunning Tavelsjö district, just 23 km/23 minutes from the centre of Umeå with everything that a city of 120 000 inhabitants can offer. Public transportation is not that perfect. Weekdays it functions pretty good. But not at evenings or weekends. So if you stay at our place you would better have access to a car. 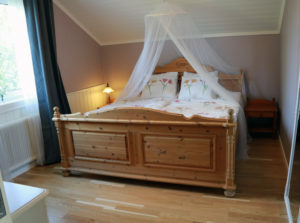 Here you stay at a calm place, close to the fish-rich Lake Tavelsjön and the mouantain Vallberget with panoramic views. If you stay with us, you can use an old wooden boat for free. And it is also possibly to buy a fishing license. We also have an exclusive fishing kayak for one or two persons to rent to a special price. For wooden boat or kayak, you can also rent an electric motor with fully charged batteries. You have your own private entrance and have full access to the upper floor and the three rooms (two bedrooms and one large living room) and a kitchen. 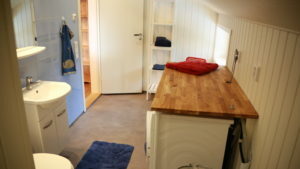 The apartment also has a dishwasher, washing machine and a dryer. We also have one extra bed and two baby-beds. 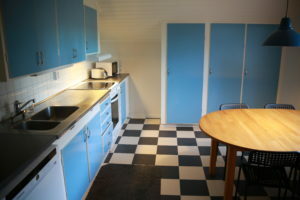 The apartment is actually perfect for up to six adults. Plus two babies. 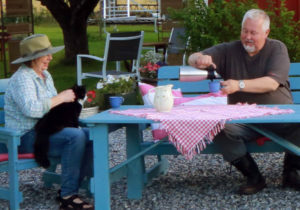 We – Lena and Mårten – likes to meet new people. But we also respect if you want to be more by yourself. We have quite a good knowledge of our surroundings, which means that we can give information on possibly excursions. Breakfast is not included in the price. For an extra fee per person we will arrange the ingredients for a breakfast delivered to you the night before. Coffee and tea will then be up to you to take care of.